15 Chapters, Republic 1940. Starring Eduardo Ciannelli, Robert Wilcox, Ella Neal, William Newell, C. Montague Shaw, Walter McGrail, Joe McGuinn, Dorothy Herbert. 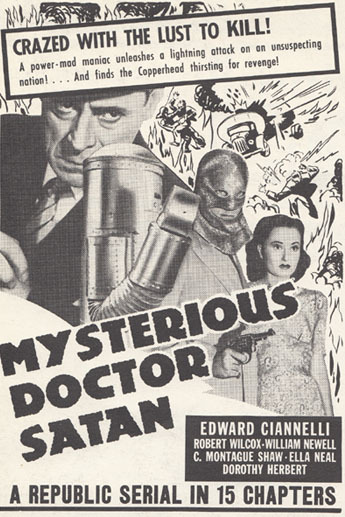 A sinister scientific genius called Dr. Satan (Eduardo Ciannelli) is determined to create an army of mechanical men with which to seize the “wealth and power of the nation”–but he needs a remote-control device invented by Professor Scott (C. Montague Shaw) in order to perfect his prototypical robot. Standing in Dr. Satan’s way is the “Copperhead,” a notorious outlaw from the Old West returned to life; this masked man is actually Bob Wayne (Robert Wilcox), who is determined to avenge Dr. Satan’s murder of his foster-father, the state governor–and also bent on rehabilitating the name of his actual father, the original Copperhead. Can this new Copperhead protect Scott, Scott’s daughter Lois (Ella Neal), and the world at large from the devilish mad doctor’s schemes? 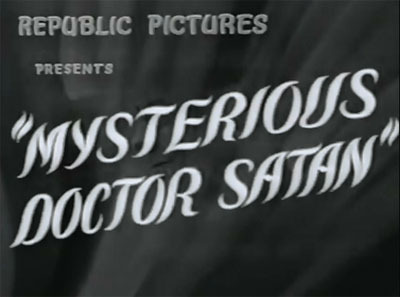 Mysterious Doctor Satan stands as one of the finest examples of Republic Pictures’ serial-making craftsmanship during the Golden Age of 1937-1942. The studio’s writers and directors took a half-completed script for a proposed Superman serial (torpedoed by the objections of Superman’s owners at National Comics Publications) and reworked it into a new chapterplay–while dealing with additional objections from censors (who were upset by the idea of a quasi-vigilante hero) in the process. In spite of all this pre-production turmoil, the finished product emerged as one of Republic’s best serials–and a strong testimony to the talent of the studio’s production team. Doctor Satan’s action scenes are unfailingly excellent, but its most memorable aspect is its ominous, occasionally nightmarish atmosphere, much of it derived from the skilled direction of William Witney and John English and the photography of William Nobles. 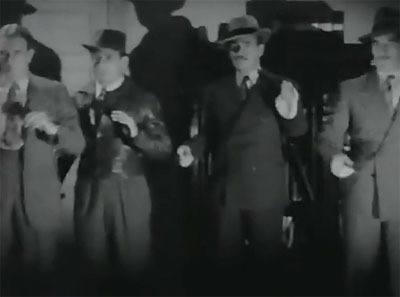 About two-thirds of the action scenes are staged at night, giving even routine fistfights a sinister and shadowy look; shadows are also emphasized in the frequent underlit shots of the villains–particularly Eduardo Ciannelli’s Doctor Satan–which give them an appropriately hellish appearance. The chapterplay’s musical score, which alternates between measured but threatening buildups to the action and fast, furious-sounding pieces to back the action itself, further enhances the moody atmosphere–and easily ranks as one of Cy Feuer’s best serial compositions. Above: A few samples of the serial’s cinematography. 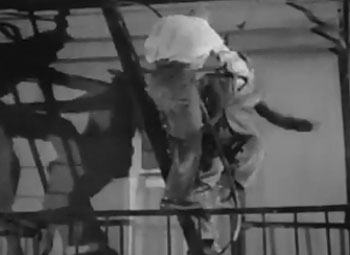 Eduardo Ciannelli confronts C. Montague Shaw at left; the Copperhead battles a henchman on a fire escape (right). 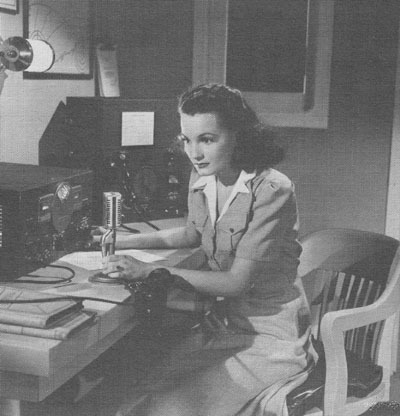 The serial’s horror-film ambience is also boosted by writers Joseph Poland, Franklin Adreon, Norman Hall, Ronald Davidson, and Sol Shor, who give the serial’s heavy a truly creepy array of weaponry–including mind-control drugs, an improvised gas chamber, and electrified vests used to execute his thugs if they betray him. 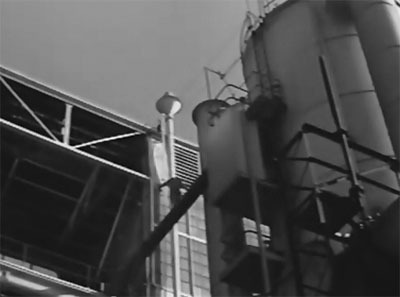 Dr. Satan’s robot, despite looking like a “water heater” (director Witney’s term for it), also comes off as very threatening–thanks to careful handling by the writers, who make the automaton no mere piece of window dressing (like the mechanical man in Universal’s The Phantom Creeps) but rather a near-unstoppable killing machine; its actions are so frightening that its bland appliance-like appearance soon takes on an eerily inhuman air. Additionally, the writers space out the robot’s rampages for maximum effect instead of over-exposing it; it doesn’t even go into action until Chapter Five. 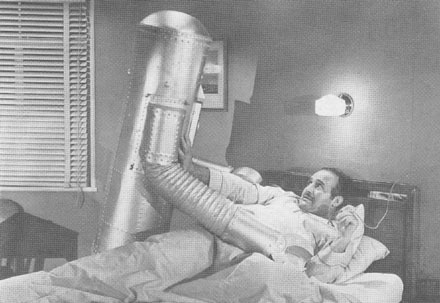 Above: The robot attacks hospitalized henchman Bert LeBaron. The writing team shows similar care in their plotting; they make sure that Dr. Satan’s pursuit of Scott’s coveted remote control “cell” never becomes too repetitive by shifting the villain’s focus from the cell to its inventor to the mineral (“tungite”) which powers the cell. These varied approaches to the central plotline, and several one-chapter subplots (like Satan’s attempt to trap the Copperhead or the Copperhead’s capture of one of Satan’s henchmen), are more than enough to save the serial, despite its fifteen-episode length, from falling into the repetitious rut common to so many Republics. The writers also avoid a pitfall too prevalent in serial scripts from all studios–the anti-climactic closing chapter: Doctor Satan’s finale is one of the most exciting conclusions ever seen in a chapterplay, with the villain on the verge of triumphantly eliminating the supporting protagonists, only to have the hero turn the tables at the last minute and send the heavy to a satisfyingly nasty end. Dave Sharpe, who doubles hero Robert Wilcox throughout the serial, fills the fight scenes with spectacular acrobatics–leaping across desks, through windows, over balustrades, and off balconies with exhilarating flair. 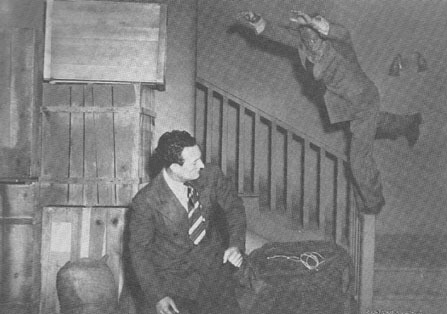 Jimmy Fawcett and Ken Terrell (like Sharpe, former acrobats) contribute heavily to the action sequences as well; as a result, while plenty of props are knocked over or smashed during fights, the emphasis is less on breaking up sets (as in later Republics) than on gymnastic leaps and falls. Tom Steele, Bud Wolfe, Eddie Parker, Yakima Canutt, and other, more down-to-earth stuntmen contribute plenty of action as well; Steele also dons the water-heater getup to play the robot. 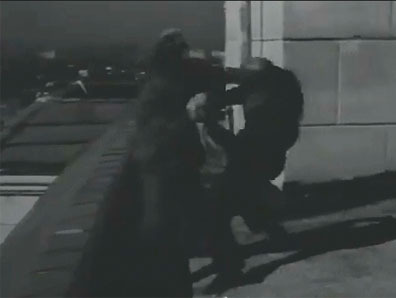 Above: Sharpe, wearing the Copperhead mask, launches himself at Terrell in a still from one of the many fight scenes. A few of the action highlights include the first-chapter fight in the Governor’s office (which Sharpe opens with a startling leap over a desk), the rooftop chase sequence in Chapter Three with its roof-edge fight and the Copperhead’s escape down an elevator shaft, the excellent cellar fight in Chapter Six, the very lengthy fight/chase at the gas plant in Chapters Ten and Eleven, and the seaside fight sequence in Chapter Fourteen. These fights, as in most Golden Age Republic outings, are spaced so as not to cancel each other out; there are plenty of non-fistfight action scenes (like the Chapter Eight horseback escape or the Chapter Nine cabin shootout) to balance the brawls. There are also several suspense sequences just as riveting as the action ones, particularly the eerie assassination of the governor in Chapter One and the robot’s lethal invasion of the hospital in Chapter Eleven. Above: A shot from the Chapter Three rooftop fight. Location shooting in Doctor Satan is not quite as prevalent as in Witney and English’s late-1930s outings, but there’s still plenty of outdoor action–particularly during the tungite-mining sequences in the middle chapters, which make heavy use of Iverson’s Ranch–and several sequences shot on real-life urban locations (like the aforementioned rooftop and gas-plant chases). Professor Scott’s country estate, with its long drive and high gates, is also obviously a non-studio location, as is the abandoned seaside hotel that figures in Chapters Thirteen and Fourteen. 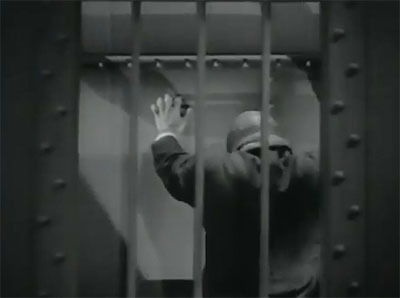 Above: Dave Sharpe crossing a gap on a plank during the gas-works chase scene. The serial’s chapter endings are memorable if somewhat less spectacular than those in some of their contemporaries; there’s relatively little Lydecker miniature work on display here (the yacht explosion that climaxes Chapter One and the diving bell sequence in Chapter Three being two exceptions). Doctor Satan’s cliffhanger sequences make up in suspense what they lack in visual ostentation, however; episode-closing scenes like the Copperhead’s first encounter with the robot (Chapter Five), the heroine’s apparent gassing (Chapter Six), the hero’s evident squashing in a constricting dungeon (Chapter Eleven), and the foggy-night plane crash sequence (Chapter Twelve) are rivetingly set up by means of expert editing, scoring, and staging. Above: A crushing wall moves in on the Copperhead in the Chapter Eleven cliffhanger. Eduardo Ciannelli, who receives deserved top billing, dominates the chapterplay and delivers one of the most memorable villainous performances of the entire sound-serial era, giving Dr. Satan a chilling blend of intelligence, cruelty, and subdued insanity. 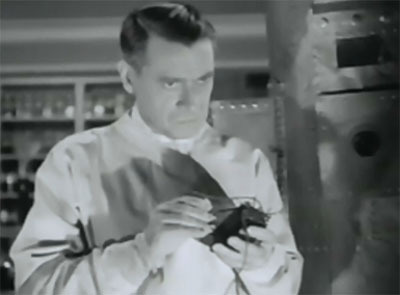 His brooding preoccupation when developing plans and his clinical precision when describing his deadly devices give the “genius” part of his mad genius character an unusual degree of believability; he also does full justice to the “mad” part of his role, gloating in a quietly devilish fashion when things are going well and glaring malevolently when crossed. Without any over-the-top ranting or even any acts of overt physical violence, he creates an aura of menace that allows him to bring tension to a scene simply by entering the room. 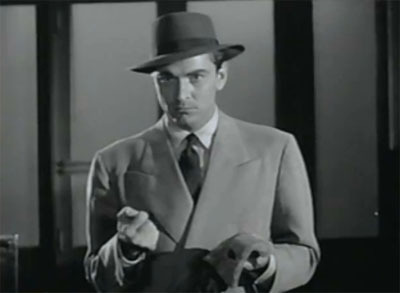 Above: Eduardo Ciannelli in his first scene. The rest of the cast, though a little overshadowed by Ciannelli, does a good job as well. Robert Wilcox makes a respectable if slightly under-energized hero, his quiet-spoken, rather melancholy manner suiting well to the serial’s moody atmosphere. While one wishes he’d deliver his dialogue with more aggressiveness when confronting Dr. Satan and his gang, he handles facial acting with more skill than many serial stars; you can “see” him thinking when his character is silently planning strategy; his reaction to the story of his father’s past in Chapter One is also well-acted. Above: Robert Wilcox holds the Copperhead mask and ponders over his father’s past. C. Montague Shaw has perhaps his best serial role as the courageous Dr. Scott, articulately and convincingly rattling off pseudo-scientific terms, authoritatively taking the lead among the good guys in more than one scene, and standing up to Ciannelli with fearless dignity. Ella Neal, as his daughter, is not as low-key as leading man Wilcox, but is decidedly serious and lacking in vivacity; she’s also given a rather strange hairstyle which doesn’t do her good looks (somewhat reminiscent of Brenda Marshall’s) justice. Her dialogue delivery is assured, however, and her acting, though somber, is more expressive and emotional than that of many Republic leading ladies; she seems truly upset when her father or the hero are threatened with death, and comes off as genuinely terrified when confronted by the villain and his robot. Above: A publicity still of Ella Neal. Veteran character actor William Newell handles sidekick duties as reporter “Speed” Martin, and successfully walks a thin line between comic incompetence and colorless competency, giving the character a likably breezy demeanor that never becomes obnoxiously buffoonish. Dorothy Herbert, a circus trick rider whom Republic’s boss Herbert Yates insisted on shoehorning into the serial, has high billing but only a few scenes as Montague Shaw’s secretary Alice; her appearance and her acting skills are not particularly impressive, but her riding skills (showcased in two different sequences) definitely are. 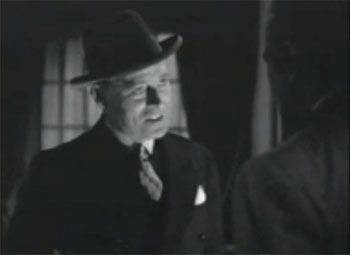 Walter McGrail plays Ciannelli’s chief henchman with sleek obsequiousness, happily gloating over his boss’s evil deeds. His character rarely leaves headquarters, placing active henchman work in the hands of stocky, raspy-voiced Joe McGuinn, who barks and snarls at both good guys and bad in memorably overbearing fashion. Swaggering Bud Geary and sneaky-looking Al Taylor head up the subordinate henchmen and get several good moments throughout the serial; Lynton Brent and Ken Terrell also play recurring thugs, while John Bagni, Frank Ellis, Alan Gregg, Ernest Sarracino, Bert LeBaron, and Paul Marion have much smaller henchman bits (the latter three all receive memorably vivid death scenes). Above, from left to right: Bud Geary, Ken Terrell, Walter McGrail, and Joe McGuinn. Charles Trowbridge is dignified but fatherly as Governor Bronson, resonantly delivering the dialogue that sets up the creation of the new Copperhead. Marten Lamont and James Bush have good parts as panicked pilots aboard a flight remotely hijacked by Dr. Satan, and the irrepressible Jack Mulhall plays the confidently chipper police chief. Kenneth Harlan is a yacht captain, Ed Cassidy a police detective, and Edwin Stanley an Army officer, while Frank Brownlee has a small but colorful bit as prospector Panamint Pete. Robert Wayne and William Stahl deliver suitably dogged performances as a pair of resolute investigators from the DA’s office; Tristram Coffin pops up very briefly as the Governor’s secretary. A hastily-revised script begun for a canceled project would not seem to be a solid foundation on which to erect a classic chapterplay, but the golden touch of the Messrs. Witney, English, Nobles, Feuer, and Sharpe–with a strong assist from the writing team and from Mr. Ciannelli–transformed this unpromising material into one of the all-time classics of the serial genre. This entry was tagged Bud Geary, C. Montague Shaw, Eduardo Ciannelli, John English, Republic serials, Tristram Coffin, William Witney. Bookmark the permalink. Another excellent revue. I have this on tape. Other revues Ive read fault Wilcox as a rather lackluster hero. I found that to be just the opposite. I thought his soft spoken underplaying was just right.As stated,Ciannelli was perfect as Dr. Satan and steals the show much in the same manner of Henry Brandon as Fu Manchu. As a side note, I feel that had Republic been allowed to film Superman instead of Columbia,a superior serial would have been the result. Kirk Alyns other work for Republic was very professional and his role as The Man Of Steel would have followed suit.I rate this 4 out of five stars. Just into seeing it and agree with everyone. This is a very good serial thanks to the directing and acting of Dr. Satan. Every time he talks I think of his great role in “Gunga Din!” He clearly added class to the serial that should be placed in the top ten. Those stunt guys never received their due. One aspect of this serial, which is one of my favorites, is the music score by Cy Feuer. It certainly adds to the emotional tone of one of my favorite serials! Love this serial, but the resolution to the chapter 11 cliffhanger is an outlandish cheat, absolutely beyond the norm.